The simplest and fastest way to plan your next trip is by using the completely free Travel Itinerary Template. This document is an easy-to-read Word document that allows you to store any and all information about your travel plans all on one page. Best of all, you can just print the document when you’re finished following the instructions below to have a convenient copy to carry with you wherever you go. Download the free document by clicking the link provided at the bottom of this page. After successfully downloading the Travel Itinerary Template to your computer quickly enter the information for your trip. First, enter the duration of your stay in days, along with the date and times. Then, enter where you will be traveling and where you are coming from. You will also list your mode of transport, the distance you’re traveling, and the address of the hotel where you’ll be staying. 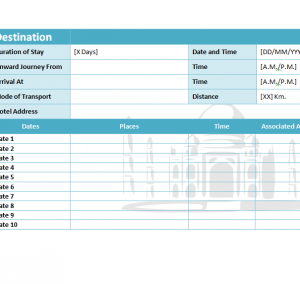 In the large table below the “Destination” section, list your travel information in greater detail. For example, if you plan on going to a certain location within the country or state you’re visiting, you can easily list them in the “Places” section after the date you plan on visiting the site. This way, you can schedule an event or excursion for each day of your vacation or business trip and never miss out on something you wanted to see or do. You can also enter the price and time of your event in this section as well. Once you have all your plans entered into the document, you will print the sheet of so you have a physical copy to take with you on your journey. Simply press “File” then “Print” at the top of your page.